I always tend to stay away from body oils and stick to body lotions/creams. Problem I have with body oils is the greasy feeling afterwards and body lotions/creams only hydrates my skin for a few hours, then my skin becomes flaky, attractive right?! I apply this mainly on my arms and legs after I shower, whilst the skin is still moist. The light oil is instantly absorbed as I rub it in without leaving any oily residue, meaning I can put my clothes on afterwards without the wait. It leaves my skin looking dewy. The next morning, my skin feels supple and smooth. After using it for a good month everyday, I can tell that my skin has improved; tone and texture wise. But I do have really bad stays where my skin suddenly becomes very, very dry due to the weather change, and this doesn’t have much effect on it. The smell of this reminds me of a medicine I use to take when I was a child. Smells exactly like it, mind you, that medicine was the best smelling and tasting one I’ve tried. Not like that is weird or anything. This is more of a sweet citrus scent mixed with the almond oil it contains. It isn’t overwhelming. It also has unsaturated fatty acids which helps lock in the moisture into the skin. The spout in the top of the bottle does help minimise over pouring but it is still easy to over pour regardless. There are many uses for this. Use it as a body moisturiser alone and or cuticle and nail treatment; add a few drops to you bath, add it to your homemade scrub, mix it with your moisturisers etc. If your skin is dry, I would recommend this but if it is very dry, I would find something else or using something else on top of this. Quickest Way to Curl Your Hair? I've never tried this brand before! Looks interesting! I have never tried this before but it looks like this bottle would last ages! This sounds lovely. I've had the same issue with body oils, and I often apply a bit too much and it can't all soak in very well…this one sounds promising though. 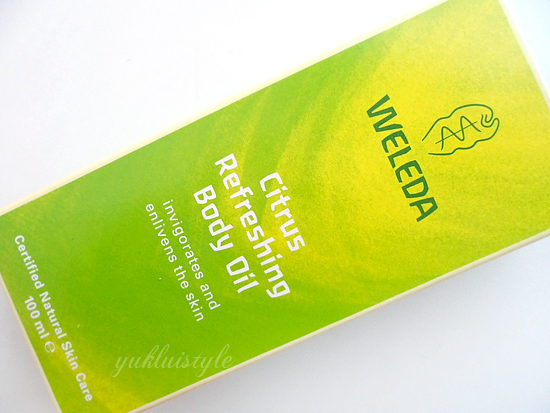 I especially like the idea of refreshing citrus in an oil – perfect for summer. I've never tried any of their products but this sounds really nice! I am now curious. What medicine were you taking as a child that this reminded yo u of? what country is this product from? The name sounds japanese. Also the package says certified – who does the certification? Interesting! A must try. I love the smell of citrus! a must try product. thanks! I don't use much of oil based products too because of the greasy effect. 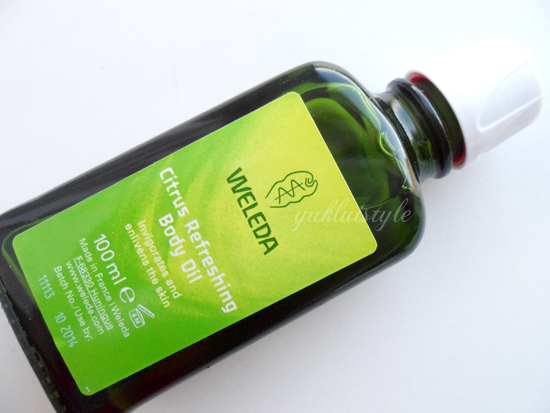 Weleda Citrus Refreshing Body Oil maybe just what I need during the dryer winter months. Thanks for sharing!